Refacing is a quick, ecological renovation method, generally taking two days or less, which enables you to make big changes to your kitchen for a lot less money. The principal is simple: we give your kitchen cabinets new life by retaining the carcasses (the “boxes”) that are in good condition, while removing the outdated components and replacing them with new ones made from recycled materials. Quartz, polymer, granite and laminate are just a few of the durable, affordable materials we use. By reducing the amount of construction debris, we’re able to guarantee environmentally-friendly renovation solutions. To get your ecological renovation off to a good start, one of our consultants will come to your home to formulate a plan and give you an estimate. With examples on hand of styles you like (don’t hesitate to visit us on Pinterest to get inspired), the consultant will work with you to create a fabulous design, while helping you make eco-responsible decisions. Once the estimate has been approved and a contract has been drawn up, you’ll be invited to our shop to finalize certain choices with our designers. Please note that our technical consultants will come to your home to verify the final measurements before beginning the work. Once renovation day arrives, our team of experts will put all their skill and know-how to work in order to transform your tired, outdated kitchen into a unique, contemporary space. You can have fun hunting for our quality seal, which will be hidden in some part of your kitchen! Would you like a more spacious environment? Ask our designers for advice on ways to maximize your space. Protect the new eco-responsible doors installed near your stovetop and oven by installing stainless steel baffles. They will serve as a protective screen against excess heat. Avoid exposing your doors and handles to small appliances like toasters and toaster ovens. They generate heat and steam that can damage the new materials. Install fixtures that produce bright light a good distance away from any thermoformed polymer products. 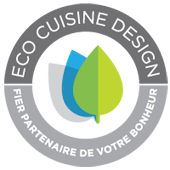 If you have any questions, feel free to call us at 1 844 GO ECOLO Monday through Friday from 9:00 a.m. to 5:00 p.m.
To help you learn more about our eco-responsible refacing services, Eco Cuisine Design answers the most frequently asked questions, organized by topic. Please don’t hesitate to consult them if necessary.